Iconography is more than a hobby for me. It's a "Window to Heaven" and an expression of my spiritual life which I can share with others. In this album, I've assembled photos of some of the icons I have ""written" (i.e. painted) during the last four years. In the past I dabbled with some hobby art projects for fun. Then four years ago a friend invited me to attend a six day icon painting workshop presented by the Prosopon School of Iconography, and I "wrote", i.e. painted, an icon of the Archangel Michael . The icon shown on the right was written by St. Andrei Rublev (c.1370-1430) and is the prototype for the icon I wrote. 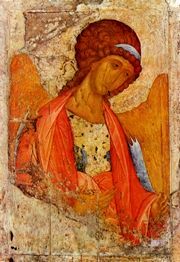 Rublev is known as the finest iconographer in all of Russia's history, and an inspiration for iconographers throughout the ages.